Uluslararası Mitoloji Sempozyumu’nu duyurmaktan gurur duyar. İnsani bilimlerin çeşitli branşlarından genç akademisyenler olarak mitlerin ve mitik sistemlerin her bir disiplin için son derece özgün bir role sahip olduğu konusunda hemfikiriz. Bu yüzden, özel olarak “mit ve mitoloji” temasına odaklanan dünya çapında bir bilgi şöleni organize ederek; felsefe, sosyoloji, antropoloji, edebiyat, psikoloji, sanat tarihi ve güzel sanatlar gibi mitolojiyle doğrudan ilişkilendirilebilecek tüm alanlardan akademisyenleri ve öğrencileri etkinliğimize davet etmeye karar verdik. Uluslararası Mitoloji Sempozyumu‘na bildiri özeti göndermek için son tarih yaklaşıyor! Place: SOS 143 at 16:00- 18:00 at Koç University. Abstract: Whether non-humans animals can have episodic memories remains the subject of extensive debate. a number of prominent memory researches defend the view that animals do not have the same kind of episodic memory as humans do, whereas others argue that some animals have episodic-like memory- i.e., they can remember what, where and when an event happened. Defining what constitutes episodic memory has proven to be difficult. In this talk I propose a dual systems account and provide evidence for a distinction between event memory and episodic memory. Event memory is a perceptual system that evolved to support adaptive short-term goal processing, whereas episodic memory is based on narratives, which bind event memories into a retrievable whole that is temporally and causally organized around subject’s goals. I argue that carefully distinguishing event memory from episodic memory can help resolve the debate. The workshop aims to intervene into ongoing debates on the constitution of political subjectivity in neo-liberal regimes, at a time in which many of the latter’s founding principles (international free trade and movement of people, the global spread of democracy, the protection of human rights and the rights of ethnic, sexual and religious minorities, etc.) appear under siege. The guiding hypothesis of the event is not, to be sure, that the ‘end of neoliberalism’ – as a rationality of global governance – is an accomplished fact. Rather, its goal is to stir a discussion over the forms of political subjectivity that are or may emerge as a result of its current transformations; where the term ‘subjectivity’ is to be understood in its duplicitous meaning, i.e. at the intersection between processes of subjection (political control) and subjectivation (autonomous self-constitution). If, as it has been suggested, the production of subjectivity is one of the main strategic ‘ends of neo-liberalism,’ its examination will hopefully contribute to shedding light on the latter’s present mutation and on what may come after its crisis, decline and ‘end’. Important note: The workshop is free and open to all. There is no need to register in advance. The workshop is of an interdisciplinary nature and counts, amongst its confirmed speakers, philosophers, cultural, political and literary theorists from some of the most prestigious Universities in Istanbul. Place: SOS 277 at 15:30 at Koç University. 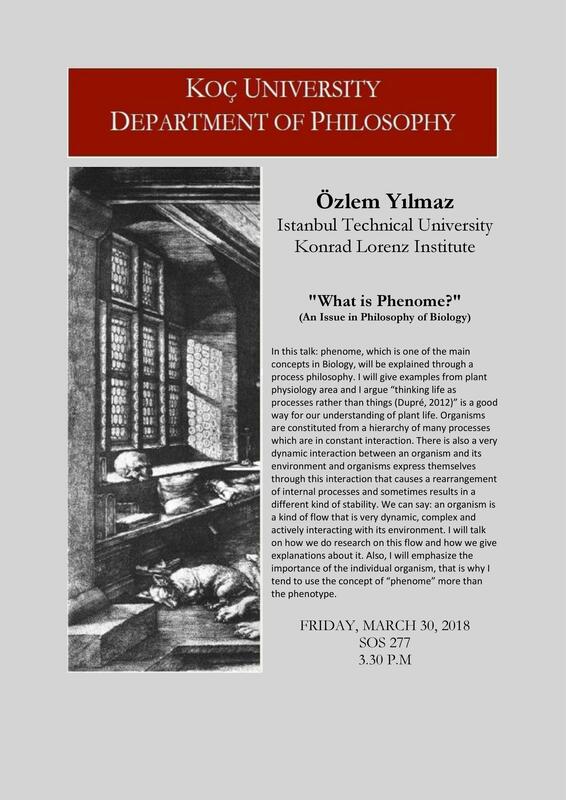 Abstract: In this talk, phenome, which is one of the main concepts in Biology, will be explained through a process philosophy. I will give examples from, plant physiology and I argue “thinking life as processes rather than things (Dupre, 2012)” is a good way for our understanding of plant life. Organisms are constituted from a hierarchy of many processes which are in constant interaction. There is also a very dynamic interaction between an organism and its environment and organisms express themselves through this interaction that causes a rearrangement of internal processes and sometimes results in a different kind of stability. We can say: an organism is a kind of flow that is very dynamic, complex and actively interacting with its environment. I will talk on how we do research on this flow and how we give explanations about it. Also I will emphasize the importance of the individual organism, that is why I tend to use the concept of “phenome” more than the phenotype.